Welcome! 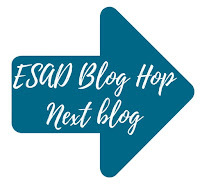 Today I'm joining in with the ESAD 2018 Retirement List Blog Hop and we are showcasing products that will be retiring on 31st May, 2018 with the release of the new 2018-2019 Annual Catalogue. 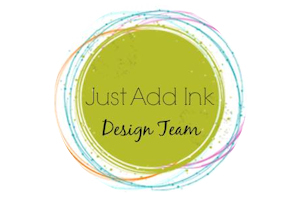 If you're following the hop you would have come from Jackie's site and her (always) gorgeous creations, otherwise feel free to start here and work your way around! If you've seen the retirement list then you'll know there are so many great sets that are leaving us. I'm going to focus on two of my faves, Birthday Blooms and Happy Celebrations. 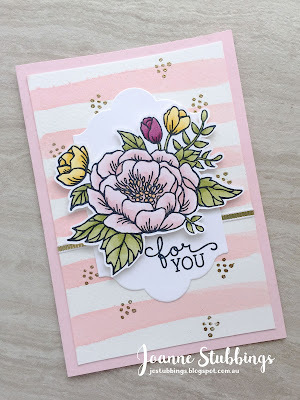 So if you've been following me for a while you'll know how dear to me the Birthday Blooms set is and how often I use it. It has such lovely colouring images and the cutest ever font, I'm so sad it's retiring. Anyway, I chose to use it today for a feminine card (honestly is there any other kind for this set?) and decided my main colour was going to be one of my favourite pinks, Pink Pirouette, which is sadly also retiring. I started with the piece of watercolor paper and using my aqua painter and the Pink Pirouette ink pad I simply drew lines across it. I let it dry before using one of the little accent pieces and embossing some gold over the top. 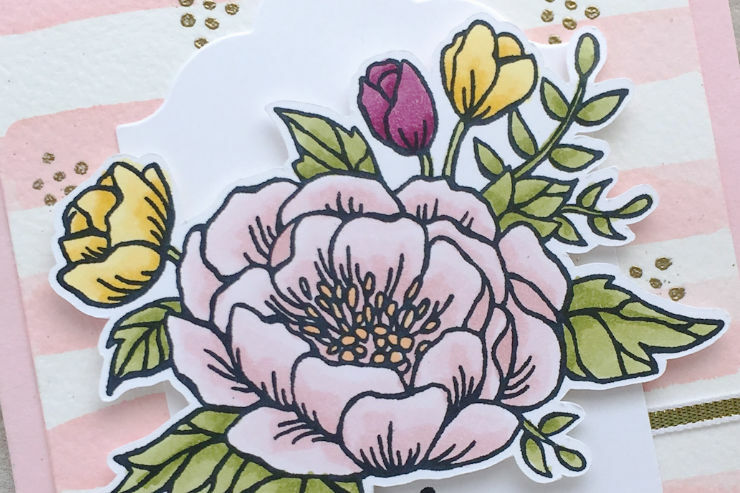 The flowers of the stamp are coloured using Stampin' Blends, Pink Pirouette, Rich Razzleberry, Daffodil Delight and Old Olive. I mounted the flowers on a piece of Whisper White that I had cut using the (retiring) Lots of Labels Framelits Dies and simply stuck the whole piece down over the top of (yes, you guessed it) retiring 1/8" gold ribbon. 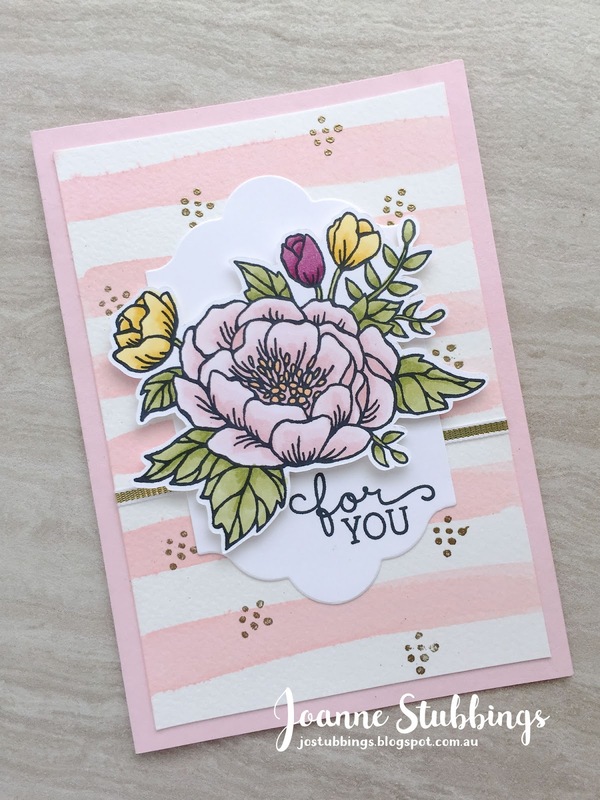 The sentiment, also from Blended Blooms was stamped in Memento. Oh so feminine, what do you think? My second card is made using the Happy Celebrations stamp set and was also extremely easy to accomplish. 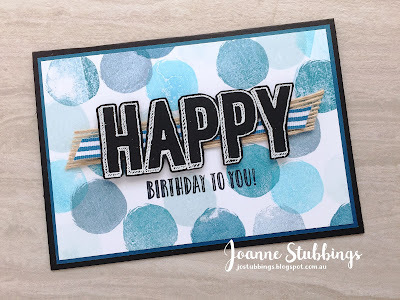 I used the largest circle stamp on a piece of Whisper White and stamped it in retiring blue tones - Dapper Denim, Island Indigo, Marina Mist, Tempting Turquoise and Soft Sky. 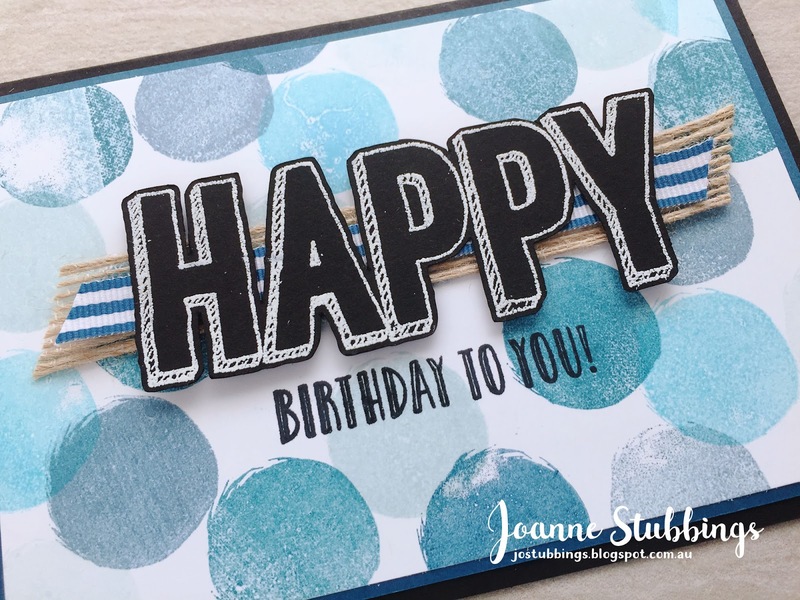 I embossed the main 'Happy' sentiment from the set in white onto some Basic Black cardstock and cut it out, mounting it over the top of some Burlap Ribbon and (yes, retiring) Dapper Denim Striped Grosgrain Ribbon. I finished it off by stamping the remaining sentiment 'Birthday to You' straight onto the background in Memento. I'm really happy this one turned out quite masculine as I find those the hardest cards to make but this was really very easy! I hope you enjoyed both projects I made, one feminine and one masculine, and that you continue on with the rest of the hop. 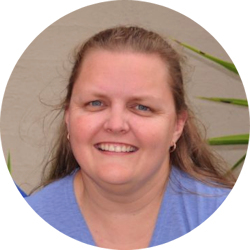 Peta is up next with some more projects that I'm sure will dazzle you! I can see Birrthday Blooms are a popular choice for this hope. Love what you have done with it. Beautiful cards. I love the softness of the beautiful pink card. 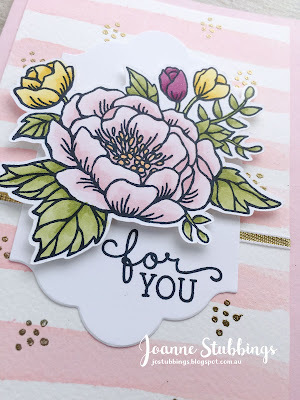 Sooo pretty in pink <3 Another Birthday Bloom card that I absolutely LOVE. I love the pink card ! Stunning ! Two gorgeous cards Jo, I can't pick a favourite. My name is Joanne Stubbings, and this is my place to share my stamping creations. I have a wonderful husband, two teenage children and a beautiful golden retriever, Maggie. 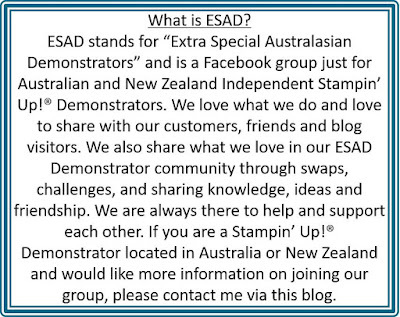 We live in Campbelltown, NSW. 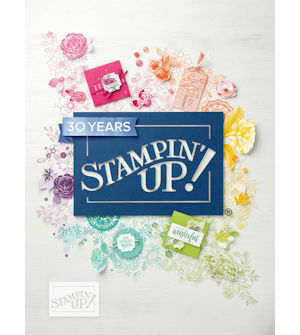 Unless stated, all images are © Stampin' Up!® 1990-2019. All other content (including text, artwork, pictures etc) is © Joanne Stubbings unless noted. If you are inspired by my work, thank you very much. You may use my ideas for your personal inspiration but please don't use them for publication or competition/challenge submissions. If you choose to CASE my projects, please don't use my original pictures on your blog or website, but instead link back here, so your visitors can see my original creation & inspiration. 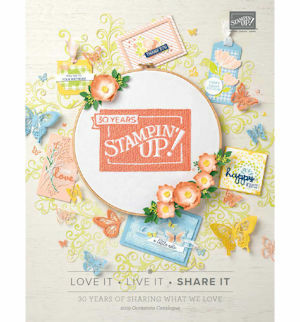 Independent Stampin' Up!® Demonstrators may use my projects/ideas in their business, where credit is given for the original idea or inspiration (& a link if appropriate online). Thanks for your understanding & support.